On opening day of Adobe MAX 2014, Adobe has released a flood of updates to its desktop and mobile applications, including new free mobile apps. At a briefing last week, the company gave us an overview of the new landscape. The Mobile Canvas. An expanded Creative Cloud ecosystem. While all the Creative Cloud desktop applications have been combed through with bug fixes and other refinements, the thrust of the update is to make the mobile environment, always handicapped compared to the desktop, more capable. The company has done this in several ways. The new apps are one but a new Creative Profile stored on the Creative Cloud that remembers your "files, photos, colors, brushes, shapes, fonts, text styles, graphics and any other assets" is the primary one. It's like your desktop in the cloud. You can access your library from your desktop applications as well as the Settings screen of any of the apps. And so can anyone on your Creative Cloud team that you share the asset with. It apparently is enabled by the new Creative Cloud Libraries asset management service which "connects desktop tools like Photoshop CC and Illustrator CC to each other -- and to companion mobile apps." So whether you are sketching on your phone or designing on your tablet, you have access to the references and libraries you would have with your desktop system. This new support is extended by new mobile apps like Adobe Brush to create imaginative brushes and Adobe Shape to capture vector art from any high contrast still. See the news release below for more details. While the mobile initiative is making the headlines, the company hasn't neglected the photography front. The briefing, unfortunately, didn't cover these developments but we've been scraped them up this morning and expect to see them in their full glory during the keynote this morning. Lightroom Web: Viewers can add comments to photos shared online. This is an odd one because, as we've shown, Lightroom Web albums are not permanent. They are available only as long as you share the album in Lightroom. Stop sharing and they disappear. So what happens to the comments? Extract Assets tool based on the Generator Node.js technology (with which we've had mixed results) to save individual components of a layout for reuse on, say, a Web site. As the news release below shows, there's a lot more to this Creative Cloud update, including new video tools like Adobe Clip a Behance Talent Search feature to help companies find talent on Behance. The new and updated mobile apps are available now, in advance of the keynote, as well as the updated desktop apps. LOS ANGELES -- At Adobe MAX 2014, the world's leading creativity conference, Adobe has announced it is shipping a milestone release of Creative Cloud that transforms how creatives work across desktops and devices. This major release includes significant feature updates to 13 essential CC desktop tools that link to a new family of integrated mobile apps. In addition, the latest versions of Photoshop CC and Illustrator CC include breakthroughs in Touch support for Microsoft Windows 8 and Surface Pro 3. Central to this release is an all-new Creative Profile that drives deep connections between CC desktop tools and nine new mobile apps that extend the power of the Photoshop, Lightroom, Illustrator and Premiere franchises onto mobile devices. 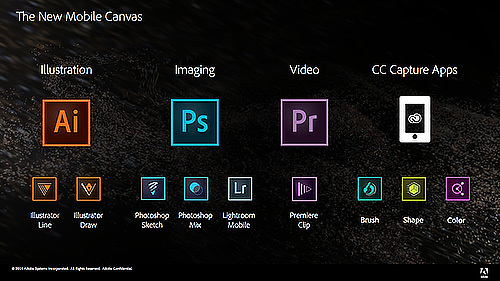 Adobe also launched a public beta of a Creative SDK that enables the delivery of mobile apps that connect to Creative Cloud, kick-starting a new era of third party app innovation for creative developers. The company also introduced Creative Talent Search, connecting creatives around the world with job opportunities from top brands and companies. These innovations and more will be demonstrated in today's keynote session at Adobe MAX, beginning at 9:30 a.m. PT. To view the event, via a live stream, visit: http://www.adobe.com/go/maxkeynote. "The pace of innovation continues to accelerate with Creative Cloud and today we are introducing a new family of mobile apps that are deeply integrated with flagship CC desktop tools, like Photoshop and Illustrator and taking mobile devices into the creative mainstream," said David Wadhwani, senior vice president, Digital Media, Adobe. "Also, new capabilities, such as Creative Talent Search, show that Creative Cloud is evolving into an increasingly powerful resource for our millions of members." This Creative Cloud release includes a new Creative Profile that connects creatives to their work, to the assets they use to create and the communities that matter to them -- no matter where they are. Files, photos, colors, brushes, shapes, fonts, text styles, graphics and any other assets are always at their fingertips. This new Creative Profile moves with creatives from app-to-app and device-to-device, so assets automatically appear when they need them, in the right context. In the Photoshop family, Photoshop Sketch lets creatives draw with new built-in expressive brushes and enables an integrated workflow with Photoshop CC and Illustrator CC. Updates to Photoshop Mixextend precise mobile compositing capabilities and now includesenhanced integration with Photoshop CC, as well as a new iPhone version. A new Lightroom Mobile app builds on integrated desktop and mobile workflows and includes features to allow clients, friends or family to select favorites and leave comments for photos shared online; and GPS information from iPhone photos now syncs with Lightroom desktop. In the Illustrator family, Illustrator Draw (formerly Adobe Ideas) gives users access to their favorite vector drawing tools and features in a modern, streamlined interface, high-fidelity integration with Illustrator CC and enhanced support for Adobe Ink and Slide. Illustrator Line, a precision drawing app, gives creatives new features for perfectly distributing shapes as they draw, plus the ability to send sketches to Illustrator CC, where they have full access to their original vector paths for editing. In the Premiere family, the brand new Adobe Premiere Clip app easily transforms the video shot on iPhone or iPad into edited videos that are simple to share. Aspiring videographers can then send their compositions to Adobe Premiere Pro CC for advanced editing and finishing. Adobe Brush CC lets designers craft unique brushes, on iPad or iPhone, to use in Photoshop CC, Illustrator CC or Adobe Illustrator Sketch. Any photograph can be made into a brush, so creatives can quickly and playfully design beautiful, high-quality brushes that can range from photorealistic, to organic, painterly or graphic. Adobe Shape CC is a simple, unique and fun way to capture and create shapes on iPhone or iPad, wherever inspiration strikes. A high-contrast photo of anything -- a chair, a pet or a hand-drawn font -- is converted into vector art that can be used immediately in Illustrator CC and Adobe Illustrator Line via Creative Cloud Libraries. Adobe Color CC (formerly Adobe Kuler) allows creatives to capture colors and save them as themes that are immediately available in other Adobe applications, including Illustrator CC and Photoshop CC. These mobile apps work with all Creative Cloud plans, giving everyone -- from freelancers, to creatives in large organizations -- access to all the benefits of a deeply integrated mobile and desktop workflow, connected via their Creative Profile. Adobe also launched the public beta of a Creative SDK that powers the delivery of new 3rd party mobile apps that connect to Creative Cloud. Adobe Creative SDK is available at: creativesdk.adobe.com. Creative Cloud Market is a collection of high-quality, curated content that's freely accessible to Creative Cloud members. Access and use thousands of professionally crafted files, including user interfaces, patterns, icons, brushes and vector shapes, to speed through desktop and mobile projects. Creative Cloud Libraries is a powerful asset management service that lets creatives easily access and create with colors, brushes, text styles and vector images through Creative Cloud desktop, mobile apps and services. Creative Cloud Libraries connects desktop tools like Photoshop CC and Illustrator CC to each other -- and to companion mobile apps. Creative Cloud Extract is a cloud-based service that reinvents the Photoshop CC comp-to-code workflow for web designers and developers, letting them share and unlock vital design information from a PSD file (such as colors, fonts and CSS) to use when coding mobile and desktop designs. Adobe also launched Creative Talent Search today. Talent Search connects creatives across the globe with job opportunities from top brands and companies. Hiring managers using Talent Search are able to use advanced discovery tools to find the right talent for their job -- for example, finding experts in Photoshop,who live in a specific city and have worked in automotive design is easier than ever. Custom algorithms recommend candidates for roles and get smarter the more a recruiter uses the system. Also, public postings will advertise job opportunities to the millions of creatives on Behance. More information is available at: https://www.behance.net/talentsearch. Today's updates to Creative Cloud are expected to be available to Creative Cloud members by the end of the day as part of their membership at no additional cost. The new and updated mobile apps are free to everyone. More information will be available later today at: http://www.adobe.com/creativecloud/catalog/mobile.html. To join Creative Cloud, special promotional pricing is available to customers who own Adobe Creative Suite 3 or later. Membership plans are available for individuals, students, photographers, teams, educational institutions, government agencies and enterprises. For pricing details, visit: https://www.adobe.com/creativecloud.html#buy.